CHATHAM — Chatham and fog are synonymous. And for the first time all summer, fog in Chatham affected an Anglers baseball game. Thursday’s game against the Hyannis Harbor Hawks (4-4-1) at Veterans Field was called a 3-3 tie after five innings due to fog. The fog started rolling in around the bottom of the fifth and picked up as the inning went along. After Blake Sabol (Southern California) struck out to end the fifth, the umpire crew of Pat Burns, Joe Peters and Mike Rabideau called for a fog delay. After the delay of 30 minutes, the crew called the game. For only the second time all season, Chatham (5-3-2) got the scoring started in the first inning, as three Anglers scored during the frame. John Rave (Illinois State) opened the scoring with a solo homerun over the center field wall. After Rave's homer, Spencer Torkelson (Arizona State) and Blake Sabol (Southern California) reached to put two runners on base. Then, Colin Simpson (Oklahoma State) singled through the right side to score Torkelson and Drew Mendoza (Florida State) knocked in Sabol on a sacrifice fly to left field. Southpaw Cody Bradford (Baylor) held the Harbor Hawks scoreless over the first three innings, but ran into trouble in the fourth. Davis Wendzel (Baylor) walked to start the inning and Seth Gray (Wright State) followed up with a single. After Eric Rivera (Florida Atlantic) moved the two runners over with a sacrifice bunt, Brady Lindsly (Oklahoma) singled up the middle to score both runners. 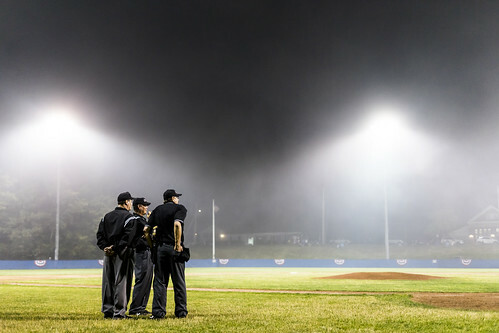 The umpires look at the field during Thursday's fog delay. Lindsly’s base knock came off of a curveball, the second consecutive bender Bradford had thrown him. The Big 12 Pitcher of the Year said he should have thrown Lindsly a fastball and wishes he could have that at-bat back. Hyannis tied the game in fifth, despite not getting a hit in the inning. Matthew Barefoot (Campbell) reached on an error and then Braden Comeaux (Rice) and Wendzel walked. Chatham relief pitcher Troy Miller then got Seth Gray (Wright State) to hit a fly ball to Rave in center, but the ball was hit deep enough to score Barefoot. Bradford — pitching in his last game before decamping for Team USA — went four innings, gave up three hits and walked three batters while only striking out two hitters. Despite the shortened ballgame, Rave and Torkelson both finished with two hits and one run scored. Holliday said he thought his ballclub should have won the game . “I would have liked to have played the last three innings because our bullpen was loaded tonight and we didn’t get to it,” Holliday said.